Find out what's really better after exercise: sports drinks or water. If you've worked up a good sweat at your gym or health club and need to rehydrate, which should you reach for: water or a bottled sports drink? Sports drinks, or energy drinks, contain electrolytes (usually sodium, chloride, and potassium), carbohydrates (sugars), and calories. Electrolytes are essential to ensuring that your body's cells are working properly. When you sweat, you lose only a few electrolytes, unless you're exercising vigorously. Normal electrolyte loss can be replaced by drinking plenty of water and eating a healthy diet. When you have a really hard workout and sweat a lot, you may lose too many electrolytes. If you are doing moderate exercise in a very hot environment, you may also lose electrolytes that can't be replaced by drinking water alone. Sports drinks can help replenish electrolytes lost during exercise, and because they contain sugar, they can also give you a boost of energy to help you get through a workout. But that doesn't mean you need to gulp them down before and after each exercise. Is Water Better Than a Sports Drink After Exercise? Water works. Proper hydration is one of the most important ways to protect the body before, during, and after exercise. You should regularly drink plenty of water, especially when you plan to get in a good workout. Water is the best thing for your body, so make sure you get enough. "Most people don't drink enough water, so when you go to the water fountain in the gym, take eight big gulps. Keep going to the water fountain and bring your water bottle," says Jody Swimmer, an exercise specialist and owner of the gym Fitness on Frankfort in Louisville, Ky.
Sports drinks have calories. One downside to sports drinks is that they do contain calories, a consideration for people exercising for weight loss. "Most people just need to drink water. Sports drinks typically have calories, and if you're trying to watch your calories, those can sneak up on you," Swimmer says. 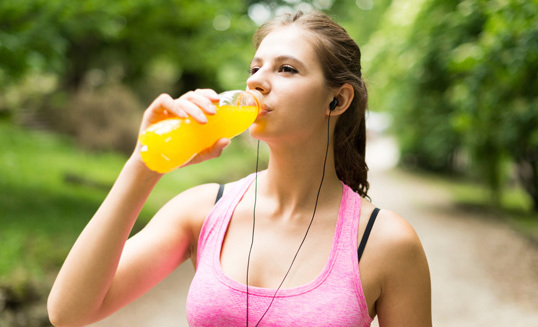 Sports drinks typically have about half the amount of sugar and calories of a soda or fruit juice. That can add up quickly if you down a couple of sports drinks, however, especially if you drink them when you're not exercising. Consider the exercise. Swimmer also notes that most people don't need sports drinks to replace electrolytes lost during exercise, because generally they don't work out hard enough to require that. But people who perform certain exercises – those who do a lot of heavy weightlifting or who are running long distances, for example – might benefit from sports drinks, she says. People exercising under extreme conditions may also benefit from drinking a sports drink after a tough workout. But people who are getting moderate exercise (working out for less than an hour) should avoid the calories and just make sure they drink plenty of water to fuel their bodies for a workout.